Engine, six cylinders in line, seven main bearing cast iron block. 210 cubic inch displacement. Aluminum cylinder head. Two overhead valves per cylinder. Spherical combustion chambers. Twin overhead camshafts. Twin constant-vacuum carburetors. Perhaps the most sought after sports car of all time, the Jaguar XK 120 has become legendary. Its sleek beauty and throaty engine roar made the XK120 a great rally car as well as a successful race car. Only 190 horsepower but with tremendous acceleration, proud owners boasted that the Jaguar XK 120, with the twin cam 3442cc engine, could reach 120 miles per hour, as other cars struggled at 80. 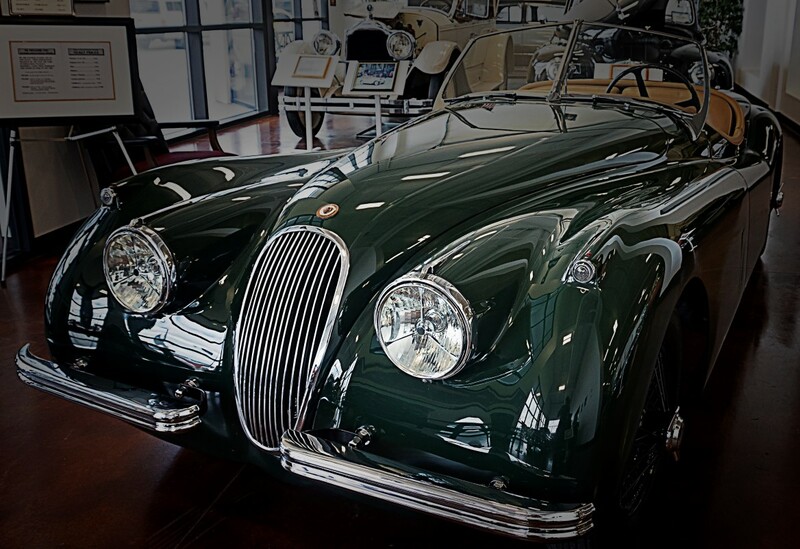 This jaguar XK 120 was professionally restored in the Terry Kesselring vintage car shops, Elsmere, Kentucky. It is a meticulous body off frame, ground up restoration, with particular exactness toward maintaining original specifications, colors, fabrics etc. Pictures and restoration details are on file. This Jaguar 120 XK has often taken top honors in judging contests. The Jaguar 120 XK was sensational to look at, with a purity of line that did not need chrome embellishment. Today, over fifty-five years later, the Jaguar XK 120 is as stunning as ever, still thrilling owners and enthusiasts.